Wow: 1500 downloads in two days. Nothing at all what I expected and I’m loving it! To people giving me feedback via email and comments – thanks! I’m doing what I can with it; not all of it can be used for a couple of reasons, but some of it is here in Beta 2. What’s new and what’s next? What’s new? Added support for Office and Natural keyboard. The newer Natural keyboards come with this notion of “F-Lock”. I hear that other keyboards have this now too, so it might be supported by many pieces of hardware… When F-Lock is off, the function keys offer Windows functions: Help, Undo, Redo, etc. When F-Lock is on, these keys are the standard F1-F12. While nothing can automatically turn on F-Lock when your machine boots, you can map the Windows function keys to F1-F12 and map the F1-F12 keys to the Windows functions. This means that when the machine boots (and F-Lock is off) you will start in F1-F12 mode and not have to toggle anything. Also, PrtSc is now supported. I think. I tried it and it seems to work, but this is a tricky key to work with, so this is open for debate. Lastly, there’s now 104 key-mapping limit, up from 16. I think this is OK with Windows; if anyone hits a limit that stops working please let me know. What’s next? Input method… with the addition of the Natural keys, the drop down lists are unruly. Easy to use and good for showing what’s selected, but long, long lists. So I plan to do something with this for input. 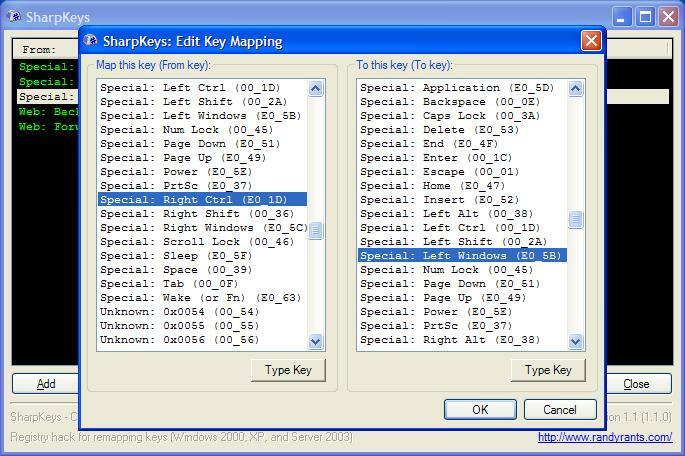 My original idea was to have a “type a key to map from/to” – I’m not alone in this, as many others suggested it. The problem is that KeyDown (the event to trap for something like this) doesn’t give enough information. For example, Left Shift and Right Shift come through as just Shift. Back and Forward come back as either 0x00 or 0xFF, depending on which property I read. Some keys, like Mute, don’t come back at all. If someone else has another option for this – aside from KeyPress, KeyDown, and KeyUp – please contact me! It will be revisit with the next release of .NET too, but until then I have something else in mind that will be in Beta 3. Otherwise I’m also planning a couple of UI updates – not much else as this is a pretty simply application. Thanks for all the interest in this!